Raffy London LTO Registration: Hassle-Free, Professional Fixer? Raffy London's not a scam but his claim of hassle-free LTO car registration is a fluke. Sure, you'll just email or text the required details and he'll do the rest (which is really the work of a fixer). I have a friend contracted his services and got into a headache and extra expense for late registration caused by RB London's professional fixing activities at LTO Makati. He earns from the CTPL insurance apparently owning an insurance company and delivers your LTO registration official receipt (OR) via messenger to your home. He charges a little extra too for the car emission test. The problem is that he does some sort of magic by falsifying the field emmission test (the anti-smoke belching) by not requiring your vehicle to undergo an emissions test (which is a necessary evil to reduce if not eliminate smoke belchers on our dangerous roads). But during my friend's registration, his one week registration window lapsed without his car being registered and Mr. London, didn't even inform him of the problem. Repeated texts and calls to Mr London just confirmed his car can't be registered due to the required test. He ended up showing up at an accredited field emission test (something every responsible car owner should do) and paid LTO late registration charges that could've been avoided if he was told earlier. If I were you, I'll just have my car registered at LTO Makati and avoid the fixers. it's not that hard to do it yourself and you'll not encourage the illegal act of fixing transactions. 5. At least two (2) valid identification cards from Registered owner photocopy to be submitted at LTO after presentation of Original ID’s. Note that my car's registered in Makati so I need to drop by again at LTO Makati on Pililla St to get a new CR. But i wanted something online much like online ordering system of NSO to get birth certificates. Such a nice concept again for the Land Transportation Office (LTO) but only if they can make it work as advertised. It's because for days now I've been trying to register but the only reply I get is a screenful of JBOSS error messages (givng users the idea of what they're using) Stradcom needs to learn many things on web application security and I won't really be surprised if LTO website gets hacked into. Heck, the SSL certificate also doesn't match the domain name that's why you'll also encounter a cerficate error when you first visit the website. LTO and Stradcom, wake up! I've decided to assemble again some sort of a DIY audio setup at home centered on the classic Pioneer KP-500 car stereo, the 80's iconic car stereo with a rotary dial for the radio tuner. I still remember it uses an 8-track cassette player and a AN214 integrated circuit power amplifier with bass and treble controls with a silver front panel. I looked online for such a dinosaur car stereo but the results were not so encouraging due to the price. I intend to visit Quiapo's Raon one of these days to look around and hope to score one. I would like the car stereo to be my centerpiece along with two Pioneer PT-6 tweeters (i used to have one of these but now probably rusty at in Paete, Laguna). Last month I've posted something about my damaged Toyota Vios 1.5G instrument panel containing my speedometer, tachometer (for RPM), fuel gauge and automatic transmission shift indicator (P/R/N/D/2/L) but now look at the picture. How i did it? 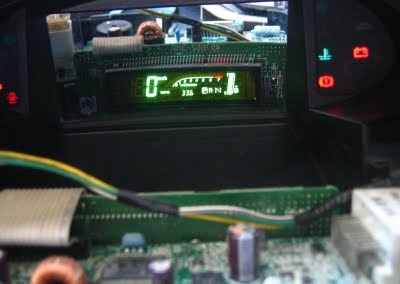 I bought an el cheapo digital multimeter at CDR King for P120.00 and used my dormant electronic repair skills that i've not used for many years. I'm na Electronics Engineer and been repairing stuff since grade 5 (when kids my age are just playing). It's a good thing there's also Google to show me IC parts functions and datasheets that enabled to to trace the problem with the voltage regulator. I used an old AC adapter to test/power up the unit prior to installation in my car. There's also the main CPU ship storing the odometer reading but no online information available. If i can get my hands on one I may be able to do Odometer rollback/tweaking but something i won't offer to anyone as that's cheating. Note that this digital salvaging of a flooded/water damaged digital instrument panel saved me P30k for a new one from Toyota casa (price already with 20% discount). I almost ordered also a JDM (japan domestic market) replacement part from a friend's surplus shop (Jay and Jer) from a Toyota Funcargo, Yaris, Altis or Echo. (note the Toyota Innova also has a digital odometer but the gauges are "old school" analog types). I've seen digital ones also for Honda Civic but more elaborate.